Mark Keefe of American Rifleman landed photos of The Glock that Wasn’t, the Glock 19 MHS. 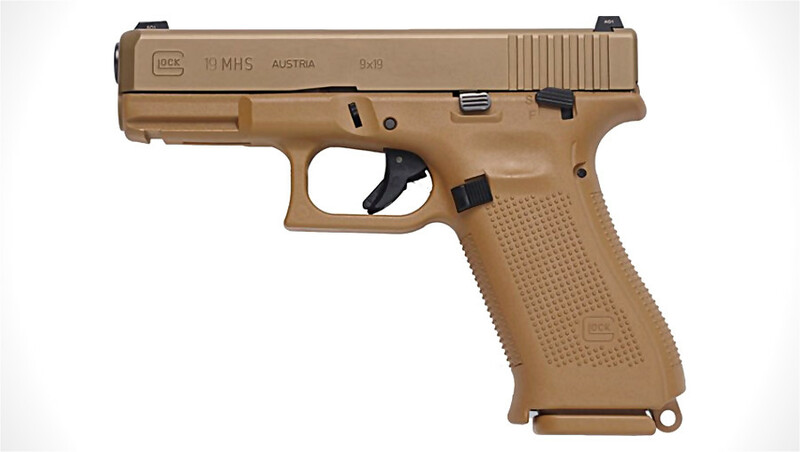 The Glock 19 MHS was designed to compete for the Army’s lucrative and prestigious Modular Handgun System contract. Unfortunately for Glock, the military awarded the contract to SIG for their P320 MHS. Glock protested the decision and the GAO responded. Now we know why the military went SIG. The Modular Handgun System program sought out a replacement for the Army’s inventory of Berretta M9-series pistols. The Beretta pistols were at their end-of-life, and the military was looking for something that wasn’t just new, but modern and improved over the fundamentally ’80s-era M9. From the contract’s description, it was very clear that the military was looking for something very close to SIG’s design. Other companies, including Glock, would have to modify their products to meet the demanding feature set outlined by the program. Now we have a chance to see Glock’s entry into the competition. The Glock 19 MHS combines elements of the Glock 17 and Glock 19 models of 9mm pistols with the so-called “Gen 5” frame styling. In addition, the pistol sports an ambidextrous manual thumb safety, one of the requirements of the MHS program. One of the biggest changes to Glock’s current production pistols is that the frame does not have fingergrooves. The contract specifically banned pistols with fingergrooves, a feature predominantly used by Glock. Other features included to meet program requirements are ambidextrous slide release levers and a reversible magazine release. The Glock 19 MHS has a compact slide on what appears to be a full-size Glock 17-length frame. The MHS outline required a pistol that could be configured as a compact for officer use and for soldiers requiring a concealable pistol as well as a full-size gun with a greater magazine capacity. It looks like Glock decided to split the difference by combining the compact and full-size components into one pistol. This is similar to what FN and Beretta did with their MHS competition entries. It’s possible that Glock also produced a smaller compact version that we haven’t seen. Ultimately SIG, with their fully-modular P320 MHS, met all the requirements to the letter. The Glock 19 MHS does not have a fully-modular frame, but it does appear to use Glock’s interchangeable backstrap system to address different user hand sizes. It does have a redesigned lanyard loop that covers the hole in the back of Glock’s standard grip frames. Of all of the entries into the MHS competition, it’s clear that SIG did the best at meeting all of the requirements. But we also know that meeting the requirements is just part of big contracts like these. Performance and reliability can affect outcomes. And ultimately price is a major consideration. And that’s where the P320 MHS really shined in the eyes of the military. SIG underbid Glock by over $100 million, asking for just $169 million for the first batch of pistols and ammunition. Glock’s price: $272 million for the initial contract. SIG also offered better licensing rights to the military on their guns and ammo. The P320 turned out to be a runaway success for SIG on all fronts. A commercial hit, the P320 quickly started snapping up police and agency contracts and is now firmly the official MHS pistol. The full GAO report on the decision to go SIG is available online (.pdf) now. Death of the Undead: Is the Zombie Fad Finally Over? The Army just realized that going to Glock was truly a mistake. I’m sorry Glock fanboys ,but the truth IS the truth whether you like it or not. The Article states that the M9 is a “fundamentally” 1980’s era pistol, when in fact it was derived from the M1951, so close as to be silly to reference it as an 80’s design. It was a pile from day one. This isn’t really over yet…Steyr has sued SIG Sauer over the removable chassis system because it infringes on their patent. If the patent is upheld, SIG is going to be in a world of hurt. This has noting to do with Glock who made an honest bid, but on Sig’s desperation to fight off its impending bankruptcy as wll as the Army’s incompetent Obama henchmen that again displayed a total lack of brains, common sense, and dedication to providing tough, long-lasting equipment to our military. And now that the Army’s wilful neglect of the extended firing and torture tests of the Sig has come out, the Army (Obama’s selected agents) was forced to begin and comply. But these tests were terminated when Sig’s poor quality control manifested this ugly head again with failures to feed, failures to eject, barrel failures, and all sorts of other failures. Sig low-balled its bid in hopes of financially rescuing itself from its impending bankruptcy, but with Steyr’s ultra strong legal claim of patent violations, Sig is now poised to financially fail, enter bankruptcy, and renege on delivering and fulfilling its low-ball contract. Is the military changing to a different type of ammunition? The last time I checked the bullets did the damage, not the pistol, if we keep shooting the same rounds out of different pistols, the real results won’t change much. I love the Sig fanboys coming out of the woodwork. A lot of people somehow became true Sig believers after the contract was awarded. ~ Cant wait for the M-9s to appear on the surplus market. Fully depressing the 92’s already having a slump. $50 M-9’s or $75 Glocks may not be in the TOO distant future. When will the CMP release the 1911-1911A1’a ???? If there is a waiting list, I cant wait……….. The civilian Sig p320s we are currently selling are being sold at 679…which is full MSRP. The Glock 19 Gen 4 is at 579…somewhat less than MSRP. The Sig is equiped with night sights for that price while the Glock is not. Further, the trigger on the p 320 is exceptional for a stock polymer type firearm. It is decidedly better than the Glocks we sell which often have buyers dropping upgraded triggers in them. If Sig is subsidizing the military firearm with civilian sales, it is primarily by using civilian sales to boost overall sales so as to bring overall production costs down by scaling up production. The Sig p320, is actually somewhat less expensive than other Sig models. FYI, I am a Springfield XD/XDm/XDs fanboy, but have nothing against Glock which has a long track record of reliability. I have been very impressed with the Sig to the point of contemplating a purchase. I’ve had both a SIG 229 in .40 and a Glock Mod 20 for the better part of two decades; each have had literally thousands of rounds through them. I’d bet my life on either of them. If you’re currently selling Sig P320’s for 679$ at your workplace A: you’re in an area that gouges for prices because FFL Transfers/Dealerships are in short order (near state borders, particularly those across from big cities) B: you’re price gouging because of the initial hype. Using a half-decent trigger and factory night sites absolutely does not justify adding another 100$ onto Glock MSRP. I got my FNS for 419$ out the door, including shipping and FFL Fees, in one of these such areas. None of the chain stores offer FFL services and, like your location, are charging MSRP+ for most of their guns. SIG USA is in New Hampshire, a Clinton/Obama state. Glock USA is in Georgia – a Republican State. The SIG P320 contract was granted just days before Trump took office. I fail to see the analogy, and you’ve failed to make one. That was just plain silly, try again. You really are not that willfully dense, are you? That trait is normally indicative of a Brain-dead Liberal. If you are not, then my apologies. we sell probably 50+ Glocks to one Sig P320 at the store!!! As usual, we get the cheapest lowest bid crap again. From a maintenance, repair, parts availability, lowest level user replacement parts, Glock has proven time after time its king. oh well, I’ll keep my 1911! I tire of seeing the Government waste money just for the sake of changing things. I disagreed when the military replaced the Model 1911 .45 acp with the Beretta 9 mm so I think buying new SIGs is another waste of money. Handguns actually see limited use in combat situations but we saw in WWII that the .45acp has superior stopping power to the 9 mm which the military downsized to simply because NATO wanted uniformity in member’s handguns. I’m curious to see how the Army Marksmanship Unit is going to turn a P320 into a National Match pistol. The US Army AMU has done nothing. The specifications of a National Match pistol must visibly mirror, as closely as possible, the issue service pistol. The X5 does not, nor was it developed by the Army AMU. SIG P320 has a hell of lot of moving parts. Failures big time. Try telling that to all of the bad guys who have been terminated by LEOs using Glocks. The 320 appears to have been designed from the ground up to exceed the army’s requirements, while Glock tried to modify an existing design just to meet the same requirements. Add the $100 million in cost savings and Sig’s win was a no brainer. 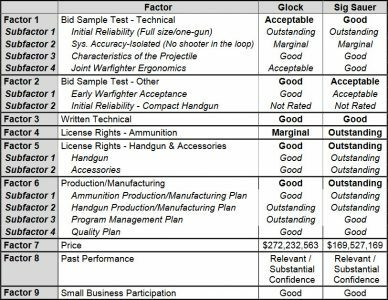 Even tho Glock failed to win the contract, the competition pushed them to further develop product improvements which is a win for consumers. Regardless of the outcome, I’m not sure that a “modular handgun” will result in anything more that boxes of unused spare parts sitting in armories. Actually, it sounds more like the Army wrote the requirements specifically to get the 320…..
actually Sig built the pistol to the Army specifications. Sig didn’t have a striker fired pistol before the design requirements were released. Glock’s submitted pistol had finger grooves, the Gen5 wasn’t the pistol submitted for consideration. Sig met the contract requirements better than the competition. Bingo. This contract was written for Sig which is not how it is supposed to work. As for the $100,000,000.00 cost savings offered by SIG. That remains to be seen. I spent almost 22 years in federal law enforcement fifteen of which as a firearms instructor. Equipment purchased by the government never seems to end up costing the same as originally contracted for when the contracts are let. A perfect example is the FBI’s S&W 1076 10MM autopistol. The Bureau originally contracted for 9,600 guns to be delivered but ended up receiving only 2,400 guns at the same contract awarded price. How many times do we see contractor “cost overruns” which the G always picks up the tab for in the end. Let’s wait and see if the SIG award actually comes in at the contract price once all weapons are delivered. The Army could have put off replacing the Beretta for another 10 years at least to save some money by adopting the A3 or similar. Very few lives are saved with handguns in the military and few if any will be saved over the M9 to SIG in combat, officers just want to look cool carrying a SIG is all. “Very few lives are saved…..” So how many deaths are acceptable before you decide new equipment is needed? Many of the old guns in service have been drug all over the world, through some of the harshest environments on the planet. In military dollars this is a drop in the bucket. Less than the price of one jet, one tank, or about the same as Obama spent on golf and American Apology Tours of the Middle East. As a tax payer, I have ZERO issues with spending money on protecting our men and women who serve. Where can I get one. I have a Sig P228 and I take it when I travel. I would like to upgrade for a newer Sig, though the P228 still functions flawlessly. I have noticed a big interest in the 320s in the shops and at shows this spring. They last about 10 minutes after the doors open at the gun shows I’ve gone to. The market is high for these type of guns,….. polymer materials, high capacity, multiple calibers, light weight, easy to work on and customize. Throw in the military and media publicity and the Sig checks ALL the boxes…they’re HOT. I got on the 320 bandwagon early….I have two. I’ve had my two tone, 320 Compact, 9mm, black/fde, for almost two years. Added better front sight, Streamlight TLR-3, and an Apex trigger….my house gun. For carrying I have an all black sub-compact with night sights. My friend shot mine and went right out and got a 320 RX. Get’cha one Walt, then grab all the mags you can find. Gee the army didn’t fall for that flimsy snap on beavertail as ‘modular’. The one on my glock came loose every chance it got, sure to be a good thing out in the field somewhere. And its hardly a very modular system, it only makes the gun bigger. Come on this was a no brainer, Glock could have easily gotten rid of that big hole in the back of the frame by using the same type of insert as my FNS40. Now its modular. Ambi slide release, ha not from Glock, something else Glock is way behind the curve on. You can almost here the people at Glock grumbling under their breath as they included a manual safety. Its simple SIG gave the govt what they asked for vs Glock presenting what they want to sell, and SIG did it cheaper. Buddy of mine works for SIG. Told me Glock submitted a multiple page challenge as to why the MHS needed a safety, how they were outdated, not required, yadda, yadda, yadda. Army responded with a one line sentence: The MHS shall have a manual safety. Glock didn’t compete for this contract, they thought they should win just because they are Glock and are as arrogant as hell. It is crystal clear SIG provided the best solution to meet the contract at the absolute best price and having carried a P320 on duty for the last 2 years, they also got a great gun. It has its own issues, (high boreline being one of them) but the trigger, right out of the box is excellent. Its a good, solid pistol that will serve this nation well. When LAPD SIS went 1911, gun journalists wrote article after article. When USMC MARSOC went 1911, same deal. When military went P320, universal praise from the gun press. When SEALs went Glock, nothing. When LAPD SIS went Glock, nothing. This comes down to nothing more than gun writers may like the Glock pistol, but they don’t like Gaston Glock. It’s personal and we in the shooting community suffer for it. What a load of crap. I remember seeing more than a few articles on the special Glocks (31?) that LAPD SIS had made for them so knock it off with the woe is poor old Gaston Glock. Glock is the most successful polymer pistol in the history of the world so far. Speak for yourself about how the shooting community “suffers” from some perceived lack of publicity for the Glock products because their sales and fan boys (of which you are clearly one) tell a much different story. FYI, having worked with SIS, they are highly competent, professional yet very, very small group of people. Their choice of handgun is no indicator of anything other than their own ego. The Kimber SIS gun was requested by a member of their team from Kimber and was never issued to them but was authorized as a personal purchase weapon for duty use. The guys from RHD (Robbery/Homicide Division) who we also worked with were underwhelmed by the publicity generated by the SIS branding. From what has been publicly revealed, Gaston is a disgusting human being, more in the mold of the old newspaper barons of the late 19th/early 20th century. From his appalling behavior towards women to the criminal conduct of his business managers to the illegal distribution of firearms to certain entities, he is no poster child for honesty, integrity and doing the right thing. Glock’s inability to recognize the inherent flaws in its product offerings is causing it to lose sales when others have waited for the polymer technology to mature, identified where Glock are lacking (notably a severe lack of modularity in grip size and the stupid, unnatural grip angle) and capitalized on their failings. I am issued a G17 for work, I carry a personal G17C for uniformed duty use and for plain clothes, I carry a SIG P320C. My next purchase will be a S&W 2.0 FDE 5″ so I run the gamut of polymer guns. Glock needs to get over themselves and adapt or they will become increasingly irrelevant in the handgun world. I was looking through the details in the table and could see that it was a close call, but then reached the price. The decision became a no brainer!